Will the other stars too follow Chetan’s example? On December 7, police and the local administration evacuated the Kuduva tribals who were living in Diddalli forest in Madikeri for generations. In that operation more than 500 tribals lost shelters and were thrown out on the streets. The government did not bother to make alternate arrangements for their shelter. 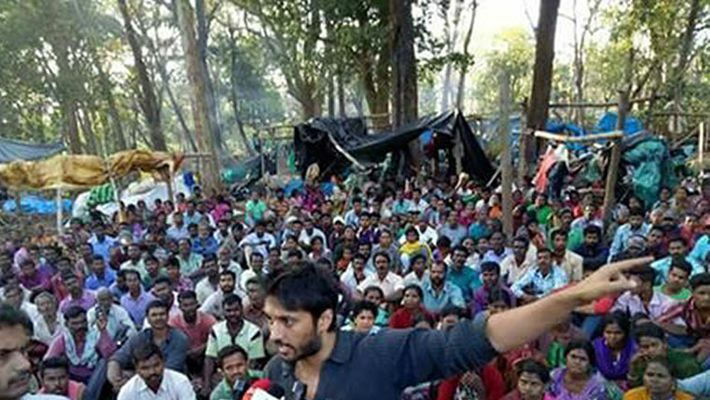 The Aa Dinagalu hero Chetan, took part in the protest with the Diddalli Tribals and demanded that government take necessary action and provide them with shelter. At a time, when most of the actors extend their support digitally, that is through the media or social posts, Chetan makes it a point to attend and participate in the protests and connects directly to the victim. Especially in Diddalli, Chetan decided to continue the protest till they get justice. 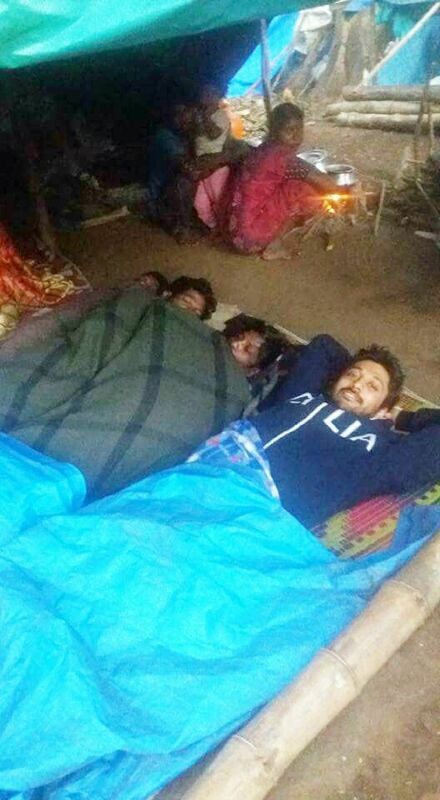 He spent the night also in the protest site in the hut giving them a moral support. Above all, Chethan took a delegation to Chief Minister Siddaramaiah and Social Welfare Minister H Anjaneya on Tuesday and demanded rehabilitation of the tribals who had lost their homes. Now CM Siddaramaiah has embarked to his appeal and will meet the victims in Diddalli on December 23, to resolve the issue of the tribals. What inspires you to be active in social issues? Chethan: I’m not merely an actor. My eyes and ears are always open for the occurrences outside the film industry. I get connected to the grievances of the aggrieved. Acquaintance with likeminded people makes me proactive with social issues. What was your reaction when you entered the tribal land in Kodagu? Chethan: I could see huge bungalows and vast coffee estates spread across hundreds of acres, just few yards away from the place where the tribals were evacuated. When those who uproot the trees and build bungalows and coffee estates are not considered as a threat to the forest, how can the poor tribals who were born, live with the woods can destroy the forest? Did you have a clear picture of what was happening in Diddalli before you visited the place? Chethan: I could find more problems in Diddalli than I estimated. Their basic needs of like shelter are also not met. The officers have given false assurances to them that they can continue to live in the forest and are not standing by their promise. We are not treating the tribals as human beings. What is your first choice- film or protest? Chethan: I came to India from the US, eleven years ago, just to explore the possibility of bringing a change in the society through art. Pursuing this objective, I took international scholarship and studied comprehensively on the subject. I had tried to create awareness among women through street plays in Chamarajanagar. I had staged a protest against Endosulfan and for the enforcement of Jan Lokpal Bill. My priority is protest, not cinema. Will you completely give up your film career? Chethan: I do act in the cinemas that have a good message. But I never sit and wait for a call sheet. Would you like to work in cinemas of social concern? Yes but I don’t have any mandates that I should be the only prominent person in the movie. But who is ready to produce movies with social concern? Did you invite other actors for your protest? Self awareness and voluntary participation is important. Invitation cards are not given to anyone for the protests. In fact, people with social concern are very much needed in such protests. Those who deliver dialogues written by others are not heroes, but those who raise their voice against injustice on their own are the real heroes.